T.I. barely had enough time to unpack his things at a halfway house in Atlanta before Federal Bureau of Prisons officials moved him to another location on Thursday. The rapper's lawyer confirmed for The Associated Press that the MC has been moved from the halfway house he entered on Wednesday to another, undisclosed location because of a "transportation issue" involving T.I. 's use of a luxury tour bus to the facility. On Wednesday, T.I. was released from a federal prison in Arkansas to the community living facility in Georgia, where he was slated to serve out the rest of his 11-month sentence for probation violation. He was followed by VH1 cameras on his journey as part of a reality show slated to air in December that will give viewers a behind-the-scenes look at his life with wife Tameka "Tiny" Harris. 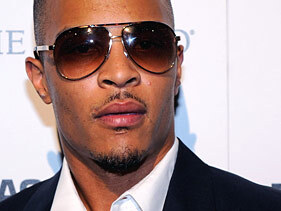 Lawyer Steve Sadow did not specify why T.I. (born Clifford Harris) was moved, but said the action was not drug-related and that he was working to resolve the situation. "There appears to be confusion surrounding the method of transportation," Sadow said. T.I. left the Forrest City low-security prison in Arkansas in the tinted-window bus, which was followed by four other vehicles. "The storm is over & da sun back out. IT'S OUR TIME TO SHINE SHAWTY!!!!!" the rapper tweeted shortly after his release. "Welcome to the beginning of our Happy Ending!!!!" CNN reported that T.I. was moved to the U.S. penitentiary in Atlanta on Friday. Sadow said Tip had offered to provide his own transportation between Arkansas and Georgia, but officials apparently objected to the use of the bus (and an attendant entourage of private SUVs) and were reviewing if it may have violated his furlough agreement.